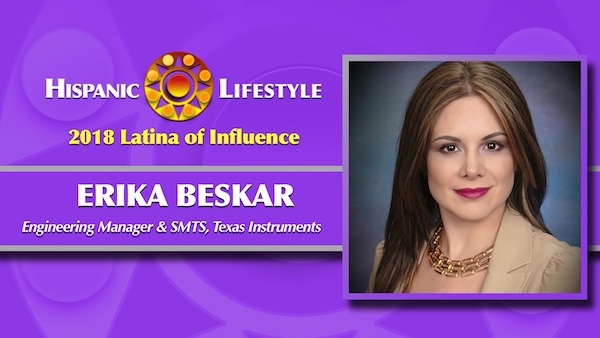 Hispanic Lifestyle is pleased to recognize Engineering Manager & SMTS at Texas Instruments Erika Beskar as a 2018 Latina of Influence. Ms. Beskar along with our entire list of 2018 Latinas of Influence are invited to participate in Hispanic Lifestyle’s 2018 Latina Conference taking place April 4 and 5, 2018 in Ontario, California. Erika Beskar started her Texas Instruments (TI) career in 2006 as a key member of a team of experts that designed a world-class automation framework used for validating a wide range of complex mixed-signal and RF devices. In 2009, Erika transitioned to a role in the High Volume Linear (HVL) organization as a post-silicon validation engineer for key TI customers. She then became the Analog Validation lead responsible for defining and driving execution improvements in the post-silicon domain. In 2013, Erika was elected to Texas Instruments Technical Ladder, TI’s technical career path that offers increasing levels of responsibility and influence on the company technical direction. Due to a unique combination of Architect-level automation experience and Validation Engineering expertise, in 2014 Erika was promoted to Validation Automation Manager in a centralized analog team. In this new broader role she was able to deploy execution improvements impacting all of the Analog Organization’s businesses as she did with HVL. In January 2017, Erika took a new role within the Analog Design Services (ADS) organization as VVCM Applications and Infrastructure Manager. In this role Erika is innovating processes and flows to drive excellence in execution methodology across Texas Instruments businesses. She is a well know and highly respected validation leader within all of Texas Instruments. With a proven track record of implementing creative validation flows and delivering product success, Erika has contributed significant revenue to TI (>$1.4B to date) and improved IC quality by contributing >20% of early silicon issue findings within Analog. Due to her technical contributions to Texas Instruments, Erika was recognized as Rising Star for the Women of Color. She received the award on during the Women of Color conference in Detroit in October 2017. In January 2018, Erika was promoted on the Technical Ladder to Senior Member of Technical Staff (SMTS). This title distinguishes Erika as the highest technical ranking Latina within the company today. She holds four patent disclosures. Erika has published and presented technical papers at IEEE (Institute of Electronics Engineers) conferences, NIWEEK and other industry platforms. She serves as an interviewer at several universities where TI recruits technical talent. Erika served as the 2016-2017 chair of TI’s Hispanic & Latino employee resource group serving more than 400 members, were she enabled professional and community events to develop diverse leaders within the TI Community. Erika is also passionate about STEM education and conducts external sessions to encourage younger generations and girls to pursue STEM careers. It is with great pleasure that I wish to nominate Erika Beskar for the Hispanic Lifestyle 2018 Latinas of Influence award for her significant technical influence and positive contribution to the Hispanic community. Erika is a highly respected technical leader at Texas Instruments (TI) with a proven track record of driving complex company-wide execution improvement initiatives and new product development processes and methodologies that have contributed more than $1.4B in revenue to the company. Since 2014, she has produced validation infrastructure improvements that have steadily including the entire product development cycle ensuring verification and validation quality for functionality compliance. In 2017, she accepted the critical role of VVCM Applications and Infrastructure Manager. In this capacity, she is responsible for driving verification and validation excellence across all business units in the Analog organization which account for about $9.5B of TI’s revenue. Erika has a unique blend of passion, drive and thoughtfulness, building bridges between businesses and leading collaborative initiatives within the design and validation engineering community that have produced stunning results. She was the Chair of TI’s Technical Leadership Conference on Validation & Test for 2015 and 2016. Since 2009, she has mentored 10 validation employees at TI, several of whom have moved on to leadership roles themselves. As the Unidos TI Diversity Hispanic & Latino initiative chair, Erika lifted membership and lead the team to connect leaders with innovative events such as Leadership Insights and Advancing leadership at TI. She is passionate for STEM K1-12 education participating in the Mi Escuelita and Trinity River Mission education centric volunteer events sponsored by Unidos. Because of these efforts, Erika has received the distinguished awards of Women of Color Conference Rising Start and has been award the title of senior member technical staff. I strongly urge you to award her with the 2018 Latinas of Influence award.